Our work in this area covers both monogenic diseases causing stroke as well as more common polygenic stroke. Work in monogenic stroke primarily focuses on CADASIL which is now recognised as the most common single gene disorder causing stroke. We have developed clinical, MRI and genetic algorithms for optimal diagnosis. We have shown that conventional cardiovascular risk factors such as smoking increase the chance of stroke in CADASIL. As part of an International collaboration we have evaluated the affects of drugs for cognitive impairment. This work links closely to our National referral clinic for CADASIL. Current work includes the use of next generation sequencing (NGS) to look for genes other than CADASIL (NOTCH3) causing familial small vessel disease stroke. Our work in polygenic stroke focuses on identifying novel risk factors for ischaemic stroke. 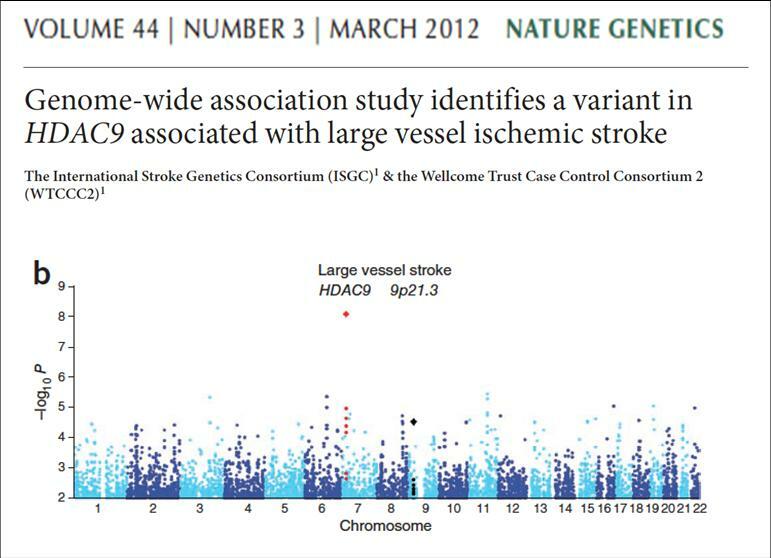 We led the clinical side of the WTCCC2 ischaemic stroke GWAS which identified HDAC9 as a risk factor for large artery stroke. We collaborate internationally through the International Stroke Genetics Consortium (ISGC) and METASTROKE (a Meta analysis of ischaemic stroke GWAS data). 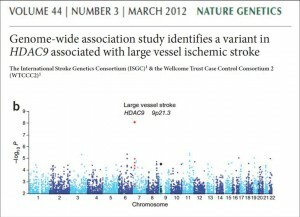 These consortia have identified a number of other genes for ischaemic stroke. We are particularly interested in genetic predisposition for lacunar stroke (cerebral small vessel disease). As well as carrying out genetic studies in lacunar stroke. We are also involved in international collaborations identifying genes for white matter hyperintensities estimated on MRI.